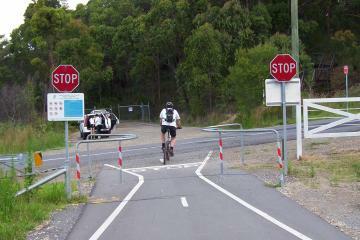 The Fernleigh Track is a disused railway line through the suburbs of Newcastle in NSW, Australia. Part of the line has been turned into a walking and cycling track, including a refurbished tunnel. 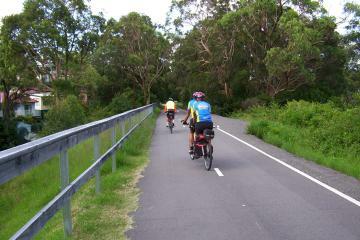 In 2004 I went for a ride along it and took a few photos (plus a video on the Fernleigh Track and Tunnel). The most notable part of the track is the long curved railway tunnel. The former railway line that once snaked its way fifteen kilometres from Adamstown to Belmont was originally constructed in the late 1880's. It was used to transport coal from mines in the Lake Macquarie area to the Port of Newcastle. Evidence of some of the mines is still visible from the track. 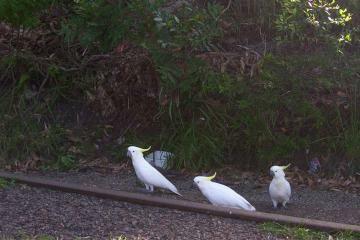 The Adamstown to Belmont Rail line helped contribute to the development of Newcastle and Lake Macquarie. As well as being used for coal haulage, it was used as a passenger service between Belmont and Newcastle with stations at Kahibah, Whitebridge and Redhead. The last scheduled steam train ran in 1967 before switching to diesel and the last passenger train ran in 1971. During the 1980's coal mines along the corridor began to close down and the line ceased to be used in 1991 with the closure of Lambton B Colliery. The railway closed in 1991, and the two Councils completed the purchase of the corridor in 1994. 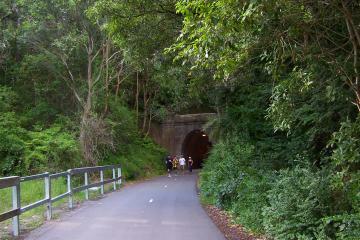 Shortly after, the Fernleigh Tunnel (having survived two earthquakes in 1925 and 1989) was closed to public access following an assessment of its structural condition. Some of the rail line has remained as part of the refurbishment of Fernleigh Track and serves as a reminder of the historic nature of the corridor. Copyright © Tom Worthington 22 March 2006.